The MediPeds® brand focuses on promoting healthy legs and feet. MediPeds® socks and hosiery are engineered to address leg fatigue, swelling, blisters, and dry skin – symptoms caused by diabetes as well as other conditions. They are constructed in the highest quality standards, utilizing technically advanced yarns, and comfort features. MediPeds® is the leader in the health and wellness market, offering styles for both men and women ranging from athletic to casual and dress. Style, comfort, and quality are the pillars of the MediPeds® brand. 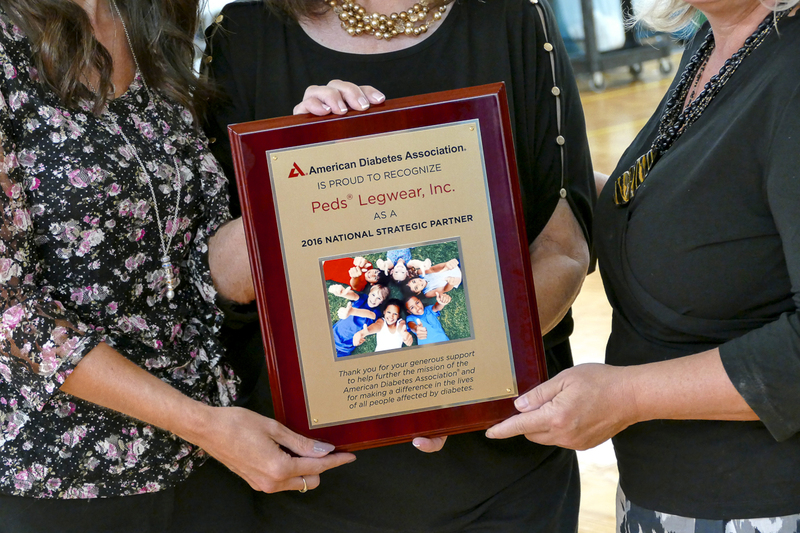 As a National Sponsor of the American Diabetes Association, MediPeds® is committed to helping people living with diabetes. We actively participate in multiple events throughout the year including fundraising, distribution of educational materials, and other community events to support the Stop Diabetes® Movement. As a resource for foot care products suitable for people with diabetes, Peds® Legwear, makers of MediPeds® has joined the movement to Stop Diabetes®! MediPeds® offerings include socks for symptoms of diabetes and educational materials on diabetic foot care. In support of those affected by diabetes, MediPeds® is working with the Association to communicate the importance of proper foot care in the management of diabetes. As a supporter of the Association's "Double Up Challenge" direct mail fundraising campaign, the company helps encourage consumers to make a donation to the Association to fund research programs and education and will match donations up to $50,000. The MediPeds® brand also supports the diabetes community through its presence at Diabetes EXPO and encourages consumer participation in local events. MediPeds® is a brand focused on products that promote foot health. Socks in the collections are all knit with branded fibers and high tech features to maximize comfort and alleviate symptoms like leg swelling and fatigue, and dry skin. The contents and information on the MediPeds® site are for informational purposes only. The information is not intended to substitute for professional medical advice, diagnosis, or treatment. If you have a medical emergency, please call your doctor or 911 immediately. COOLMAX® and LYCRA® are registered trademarks of INVISTA™. NanoGLIDE® is a registered trademark of Next Fiber Technology, LLC. XS™ is a trademark of UNIFI®, Inc.
MediPeds® will respond back to you in a timely manner during business hours 8am - 4pm EST, Monday - Friday. Copyright © 2019 MediPeds. All Rights Reserved.